How do you feel in front of crowd? Do you communicate with influence & impact? Recently, a friend asked a favour: run a training session at her conference. As I heard myself say “of course” I heard the next words out of her mouth … “on Speaking Skills”. OK, so I make a living with my voice, (like most people) however, it’s been a while since I stopped and considered how effective I was at this skill of communicating with influence and impact. How about you – How effective are you at speaking? (You know what I mean – publicly). My audience are Civil Celebrants and their response to my analysis questions were rather simple - seeking tips, techniques and skill boosting confidence. There is no excuse to speak effectively. I checked my office library and found a couple of books which I thought could support my research to build a super 60-minute session and I contacted a couple of speech pathologists in my network for their ideas. 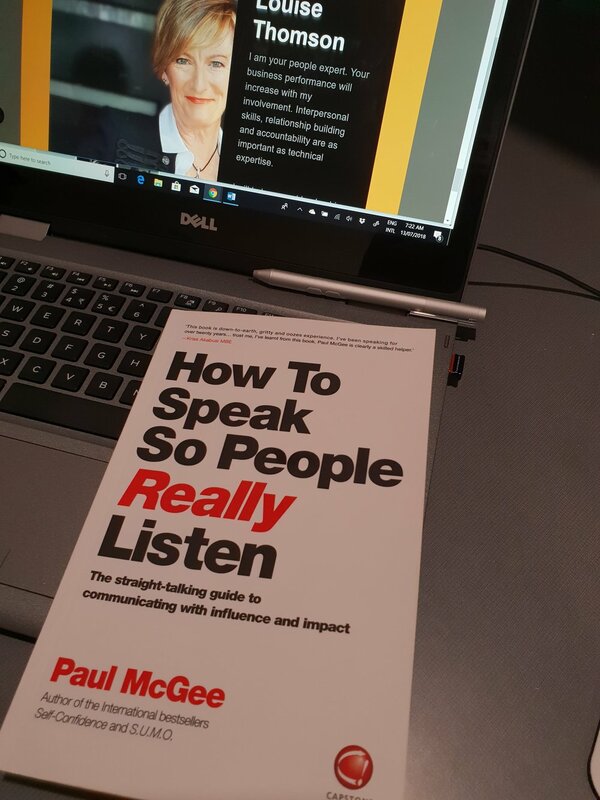 I then popped into a book store and found a new book on the market: How to speak so people really listen – The straight-talking guide to communicating with influence and impact by Paul McGee. Wow – what a find. It quickly dispels some myths and sins about speaking and answers some popular questions which I suspect go through people’s minds when their preparing a speech (or winging it)! The main component contains the eight ways to encourage people to listen to you when you speak. That’s what you want, it’s not how fancy your PowerPoints are, or what you’re wearing, it comes down to influencing the listeners. Velcro – your message needs to be so sticky, it needs to hold like Velcro. Opposite to being coated in slick smooth Teflon. You don’t want people to be in awe of you, they want to be able to recall what you said. Repetition, unfamiliar language and telling stories will help your audience. Value – nerves, shallow breathing, lacking confidence, winging it and not knowing your audiences’ expectations are an identification that you don’t value their time. Thinking about the audience as your customers you’re serving is paramount. Take the focus off yourself and you''ll soon forget about your worries of how you sound or appear. Version – which version of you is the speaker? Is it the authentic you or is it the polished you who is too concerned about the slides rather than sharing a very personal story and how passionate you are about your subject. Your attitude should shine through. Visual – your audience doesn’t see words, they see pictures, they hear with their eyes and they’re curious. Compelling titles, slides with photos, using props and turning figures into pictures e.g. one million litres of water or enough water to fill the MCG (iconic sports stadium in Melbourne, Australia). Help your people remember your word pictures. Videos – use videos to emphasize your messages. Consider your library being YouTube – you can select almost any video to highlight or make a point or at least add some variety and humour to your speech/presentation. I won’t be using a video in my power session; however, I will be recommending that they make videos of themselves as part of their homework to practise what we discuss. Which of these FIVE Vs could make a difference to your next presentation, meeting or even a one on one conversation? When we think of improving our performance of speaking, we think of our body language, our idiosyncrasies and handling our nerves – which is fair enough. If this is the area of your development needs, view a great TED – you may have seen the awesome talk by Social Psychologist Amy Cuddy – it’s 20 minutes of worthwhile viewing (like almost 48 million others). Amy captures the critical belief that we can quickly shape our body language to change the perception of others. There are many other aspects to consider when you want people to listen to you. And on top of that, people have expectations of you when they listen to you! In today’s smart and generous world, there is no excuse to communicate, to speak effectively so that people will listen, really listen to you. Invest in Paul’s book, invest a few hours of your time to read it and practise his recommendations. Please let me know how you progress with your speaking and please connect with me if you need my guidance to boost your speaking performance.